The use of lyophilized powder requires it to be reconstituted with SWFI by gently swirling the mixture for 15-20 minutes. This can be a tedious and time consuming operation to do by manual mixing. The IKA Works MS 450 Swirler can run at a specific speed for the optimized mixing requirement of lyophilized powder. The MS 450 Swirler is the perfect unit for doing this operation hands free. 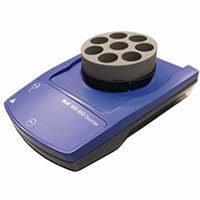 The MS 450 Swirler can gently swirl up to 8 vials at one time.